When My Memories, a Polaroid company, first contacted me about doing a scrapbook software giveaway and review, I almost said no. After all the primary purpose of the My Memories Suite 3 software is for producing digital scrapbooks and other photo based projects, not jewelry making. But then I realized the wonderful range of templates and digital features could also be of great use to jewelry artisans. So I agreed! Going digital has enormous benefits compared to traditional scrapbooking especially in not having to buy and stockpile all sorts of physical materials. While the photo frames are originally designed for people and lifestyle pictures, many of the same approaches can be used to showcase jewelry designs and promote the work of an artisan as you will see below. The software works for either Windows or Mac based computers. It is relatively easy to use especially for those who have some experience using photo editors. If you have been designing your own logos and promotional materials then this program will not be a problem. I went to their extensive free download section and selected several template and embellishment kits that I liked to play around with. I learned that depending on what I chose, the newly installed kit may not be seen as a template but found under embellishments or backgrounds and so on if that is what it is. This was clarified by their excellent and responsive Support team when I asked. Also a tip for Windows based PCs - it's best to install the kits by running the installer as an administrator (from the start menu). What's also great is the ability to add other non-My Memories designs - you add it to the relevant My Memories folder of the computer's C: drive. The beautiful Good Feeling design caught my eye. So I used some of my jewelry pictures to fill in the photo slots. A cropped version can thus be a Facebook Timeline image. The software gives all sorts of choices. I could have added more pictures, text and other embellishments like brads, flourishes, ribbons and so forth if I wanted. Or removed some from the original template. I came across the Classic Red Tags kit below which are really Christmas gift tags. But the red color is that of my "brand". So I played around with a couple of designs I liked and deleted the rest. Here are a couple of tags that I could tie to necklaces and bracelets. For the folding one, I merely positioned the design such there was space to cut the card stock wider. Making extra tags are easy - just copy and paste until you fill the page with the design you want after deleting the other design tags you don't want. 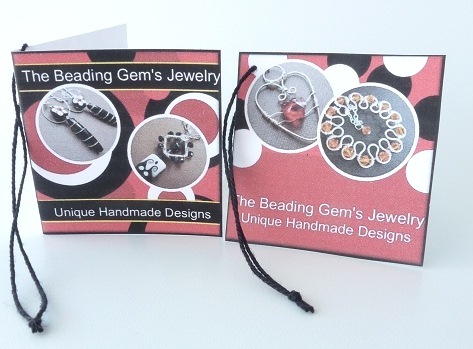 You could also show off your jewelry designs in custom calendars! There were so many great backgrounds available that paper jewelry artisans would think they are in paper heaven! I know I am after developing some new prototype designs. 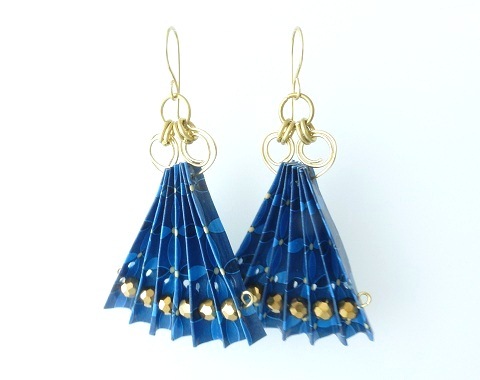 The background pattern I choose was dark blue one from the free kit "Transverse" shown below. I just printed out a small size - the 5" x 7" onto my inkjet paper. To seal the inkjet printout, I used 2 sprays of a craft varnish, drying in between. I recommend 3 as there was a tiny bit of color bleed. Then two layers of Mod Podge for paper as added insurance. 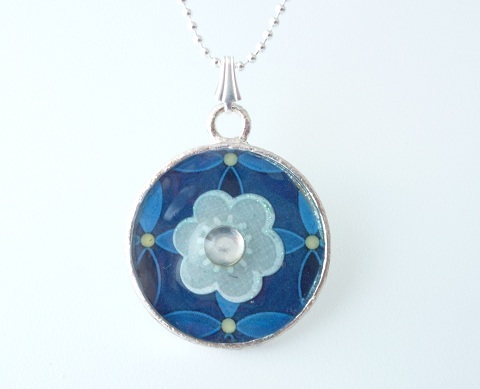 I placed a bought scrapbook paper flower with a simple crystal for the pendant below and then added a dimensional glaze to cover everything but the crystal. You could also use all sorts of shape cutters. 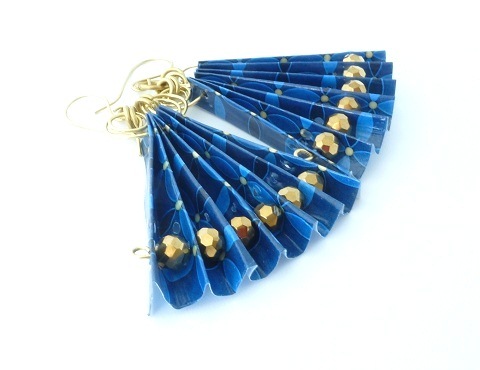 The folded paper fan earrings were a combination of paper, yellow brass wire work and crystals. You can tell I had a lot of fun making these! And that included using my Modahaus photo jewelry setups! If you wish to try your luck, please make a comment below. Make sure you leave contact info if you do not have an online shop or blog. Extra entries if you become or are a blog subscriber or follower etc . If you also do shout outs about this giveaway, those will count as additional entries too! Please say so in the comments. It ends in a week's time at 6 pm EST Monday, July 9, 2012. I will pick a winner randomly and announce the results as soon as possible after. So be sure to leave a contact email if you don't have an online link or make sure you come back and check! Otherwise I will redraw in a week. Good luck! This software sounds so awesome. When I saw the fan earrings I felt giddy. Can't wait to try them. I would like to enter the giveaway. I will also post on my FB page etc. Pearl, your paper jewels are stunning! Esp the fan earrings - I love them! Really great review BTW - lots of fabulous ideas for jewelry making, I would not have thought of this as useful, but I am convinced. Ooohhh...You've given me some wonderful ideas & ways to use this software. I'd love to have it! I love this software. Thank you for bringing it to our attention. I have come to know you as a friend through your newsletter. I watched the video, and it does look quick and easy! My husband's 50th birthday is coming up in late August. I'm thinking this would be a fun gift for him showing pictures throughout his life! I also love the banner you showed on your blog -- great for a FB company page! PS I am a subscriber and also follow on FB. Love the paper and especially the fan earrings you made from it! I subscribe to your blog and follow you on facebook. The software looks terrific. How generous of them to offer this and I love your ideas of using it for making jewelry. Cool. I can be reached at http://www.mikicatdesigns.com or email me at michele@mikicatdesigns.com. Would love to try this program. Wow!! The software sounds great. Oh that looks fabulous :) It would be AWESOME to have this since I'm planning a digital scrapbook project and was just trying to figure out what program to use for it! Oh my fingers and toes are all crossed!! The possibilities are endless! My mind is already thinking of the different ways to use this in jewelry as well as in scrapbooking! This looks like it could be a really useful piece of software, both in jewelry design and for promotional materials. I need a much better logo than I have now, one that I can resize for various venues. Well, I did my original post all wrong. I didn't check the correct box below and I forgot to mention that I subscribe to the blog and am a facebook follower as well. So I will try again. This looks amazing! Thanks for the opportunity to win.